Description: "Not for Resale" text on front cover, manual and DVD-ROM. Roar offroad and take on thick woods, icy tundra, rocky hillsides and deep rivers in 40 massive environments. Rip it up on 20+ authentic ATVs through Nationals, Supercross, Freestyle Stunt and Enduro courses as well as Mini Games! Insanely competitive racing with up to 4 players on a single console or online. Tear up the terrain with an all-new rockin' soundtrack, including songs from Garbage, Korn, Filter, Cypress Hill, Alien Ant Farm and System of a Down! 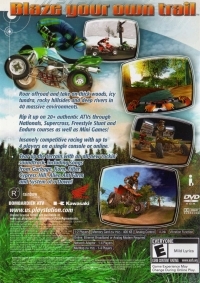 03-28-2019 tripredacus Description "Not for Resale" text on front cover, manual and DVD-ROM. 04-24-2015 yancakes Description Says "NOT FOR RESALE" on bottom left of front cover as well as the manual and the disc, and the box has no barcode on the back. 04-24-2015 yancakes Box Text Blaze your own trail Roar offroad and take on thick woods, icy tundra, rocky hillsides and deep rivers in 40 massive environments. Rip it up on 20+ authentic ATVs through Nationals, Supercross, Freestyle Stunt and Enduro courses as well as Mini Games! Insanely competitive racing with up to 4 players on a single console or online. Tear up the terrain with an all-new rockin' soundtrack, including songs from Garbage, Korn, Filter, Cypress Hill, Alien Ant Farm and System of a Down! 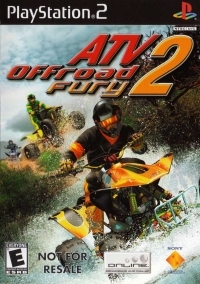 This is a list of VGCollect users who have ATV Offroad Fury 2 (Not for Resale) in their Collection. 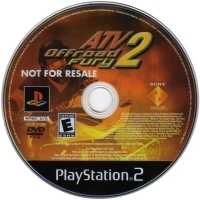 This is a list of VGCollect users who have ATV Offroad Fury 2 (Not for Resale) in their Sell List. This is a list of VGCollect users who have ATV Offroad Fury 2 (Not for Resale) in their Wish List.